I’m gearing up to do some presentations in May, one will be an updated repeat of the co-presentation I did with ECU’s Research Librarian Getting found using social media to build your research profile, the second will be a an extension focusing on content: where you can share your work and activities. Today though, let’s consider professional profile platforms in terms of membership. 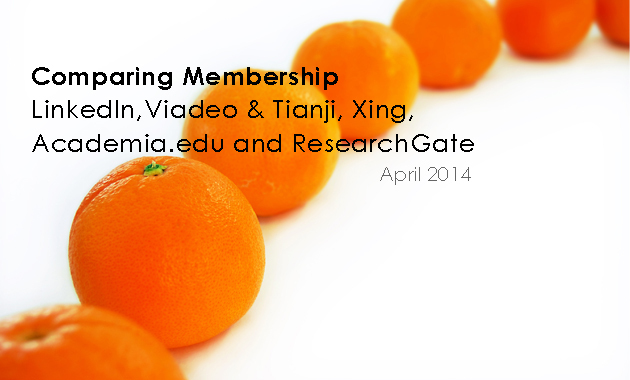 For this exercise, I am considering LinkedIn and it’s competitors: Viadeo & Tianji (Tianji is the version of Viadeo for China) and Xing (primarily focused on the German-speaking world)*, and also the two main profile platforms for academics and/or researchers: Academia.edu and ResearchGate. [*I wrote a post in August 2013 about LinkedIn, Viadeo and Xing: Quick Overview of Professional Profile and People-In-Business Focused Networking Sites; if you’re interested). 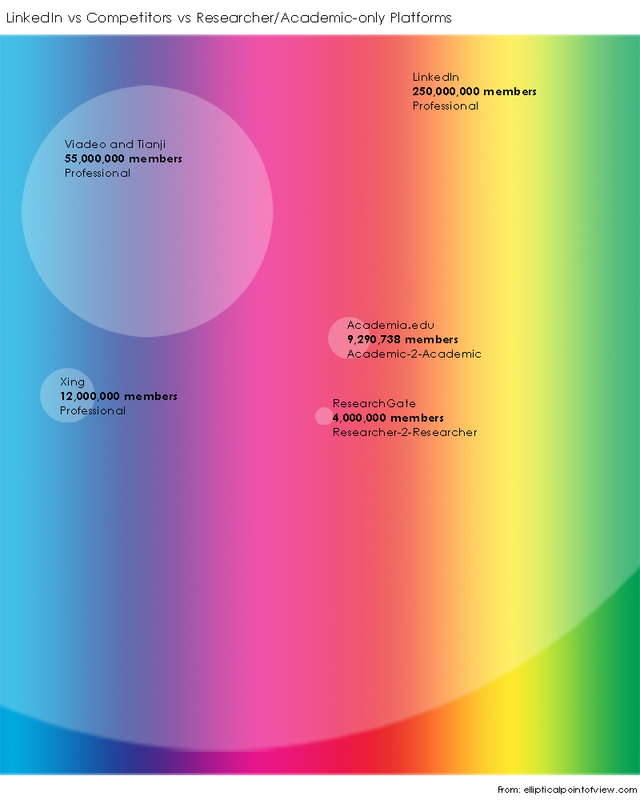 Uhm… in the graphic you scaled the radius of the circles representing membership proportionally to the number of members. That sort of overemphasizes the ratios, as I think one intuitively assumes the _area_ to be proportional to the number of members. I’m thinking of a bird’s eye view of a crowd of people gathering on the ground for instance. And suddenly LinkedIn does not appear that much bigger any more, does it? I actually scaled the circles representing membership to how much the membership for any given platform would represent on LinkedIn (given LinkedIn does have the biggest membership, by several clear miles). So each circle represents a percentage, not the number of members.